The IDBI Bank has invited online applications from eligible Indian citizens for the posts of Assistant Manager, Executive, Specialist Officer. 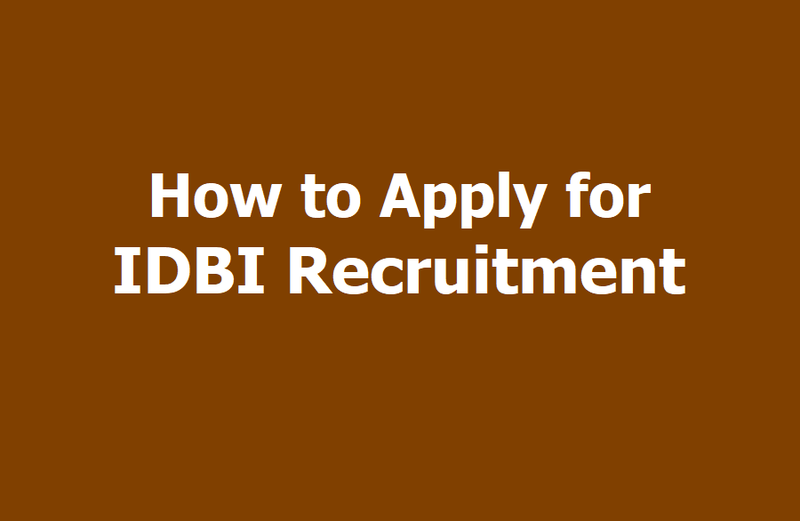 Candidates fulfilling required eligibility criteria can apply online through the IDBI Bank's official website. Recruitment in IDBI Bank are strictly on all India basis by open competition and the Bank has not hired or authorized any agency or organization or any individual to recommend or recruit any personnel on its behalf or collect any money or commission or charge for recruitment or training or coaching etc. c. 120 vacancies of SO posts. Candidates can submit the online applications for the above mentioned posts through the official website of IDBI- idbi.com. 1. Candidates are required to apply online through IDBI official website www.ibdi.com (Careers/Current Openings). 2. No other means/mode of application will be accepted by the Bank. Candidates are required to have a valid personal email ID and Contact No. 3. Candidates are advised to carefully fill in the online application themselves as no change in any of the data filled in the online application will be possible/entertained. Prior to submission of the online application candidates are advised to use the 'SAVE AND NEXT' facility to verify the details in the online application form and modify the same if required. No change is permitted after clicking on 'FINAL SUBMIT' button. There is a provision to modify the online application prior to submission only. 4. All the particulars mentioned in the online application including Name of Candidate, Category, Date of Birth, Post Applied for, Address, Mobile Number, Email ID, etc. will be considered as final and no change/modifications will be allowed after submission of the online application form. 5. An email/SMS intimation with the registration number and password generated on successful registration of the application will be sent to the candidate's email ID/ Mobile Number specified in the online application form as a system generated acknowledgement. If candidates do not receive the email and SMS intimation at the email ID/Mobile number specified by them, they may consider that their online application not been successfully registered. 6. An online application which is incomplete in respect such as without photograph and signature uploaded in the online application form/unsuccessful fee payment will not be considered valid. Any information submitted by a candidate in his/her application shall be binding on the candidate personally and he/she shall be liable for prosecution/civil consequences in case the information/details furnished by him/her are found to be false at a later stage. 7. Not more than one application should be submitted by any candidate. In case of multiple applications only the latest valid (Complete) application will be retained and the application fee/intimation charges paid for the other multiple registration(s) will stand forfeited. Multiple attendance/appearances at the time GD/PI will be summarily rejected/candidature cancelled.